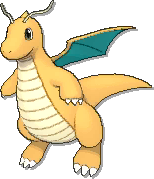 Dragonite is a Dragon/Flying type Pokémon introduced in Generation 1. It is known as the Dragon Pokémon . The effectiveness of each type on Dragonite. 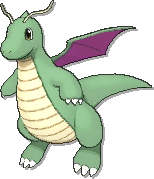 In Generation 1, Dragonite has a base Special stat of 100. 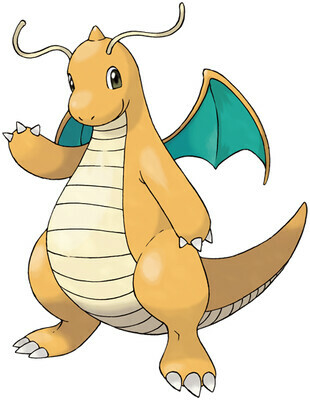 In Pokémon Yellow, Dragonite has a catch rate of 9. In Generations 1-4, Dragonite has a base experience yield of 218. In Generation 2, Dragonite has a base Friendship value of 70. An extremely rarely seen marine POKéMON. Its intelligence is said to match that of humans. It is said that this POKéMON lives somewhere in the sea and that it flies. However, it is only a rumor. It is said that this POKéMON constantly flies over the immense seas and rescues drowning people. This marine POKéMON has an impressive build that lets it freely fly over raging seas without trouble. It is said that somewhere in the ocean lies an island where these gather. Only they live there. DRAGONITE is capable of circling the globe in just sixteen hours. It is a kindhearted POKéMON that leads lost and foundering ships in a storm to the safety of land. It can fly in spite of its big and bulky physique. It circles the globe in just 16 hours. Only a very few people ever see this POKéMON. Its intelligence is said to match that of humans. It can circle the globe in just 16 hours. It is a kindhearted POKéMON that leads lost and foundering ships in a storm to the safety of land. It is said to make its home somewhere in the sea. It guides crews of shipwrecks to shore. This Pokémon saved a shipwrecked man, taking him to a remote island—a paradise occupied solely by Dragonite. Incur the wrath of this normally calm Pokémon at your peril, because it will smash everything to smithereens before it’s satisfied. You’ll often hear tales of this kindhearted Pokémon rescuing people or Pokémon that are drowning. Dragonite learns the following moves in Pokémon Let's Go Pikachu & Let's Go Eevee at the levels specified. Dragonite learns the following moves when it evolves in Pokémon Let's Go Pikachu & Let's Go Eevee (regardless of level). Dragonite learns the following moves in Pokémon Ultra Sun & Ultra Moon at the levels specified. Dragonite learns the following moves when it evolves in Pokémon Ultra Sun & Ultra Moon (regardless of level). Dragonite learns the following moves via breeding in Pokémon Ultra Sun & Ultra Moon. Details and compatible parents can be found on the Dragonite egg moves page. Dragonite can only learn these moves in previous generations. It must be taught the moves in the appropriate game and then transferred to Pokémon Ultra Sun & Ultra Moon. Is there any type all 6 psuedo legendaries can't cover? From these pokemon which will I choose? Dragonite is smaller than Dragonair?! Which one should learn Fly? How do you get Dragonite to learn Roost? What is the chance of a fishing spot bubbling?